Leamington have brought Stefan Moore in for a third spell with the club. The experienced former Aston Villa striker who has scored 35 goals in 79 games for Brakes, was at Corby Town where he notched ten goals in all competitions to give them a fighting chance of avoiding the drop from the Northern Premier League Premier Division. 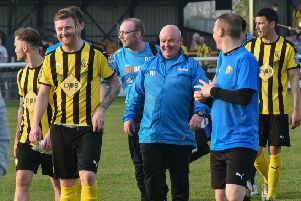 However, having been on the bench for Town’s last two games, the 33-year-old has opted to return to the Phillips 66 Community Stadium and a reunion with manager Paul Holleran. “Stefan is a friend of mine and he signed a (dual registration) form with us earlier in the year,” said Holleran. “He said he’d help Gary (Mills) out at Corby and that hasn’t quite happened as he would have liked and we kept in contact. “We’ve brought him in for the home run if you like. “He’s got the experience and know-how and hopefully he will score some important goals. Moore goes straight into the squad for tonight’s match at Cinderford Town, with Brakes chasing the win which will cut the gap on Southern Premier League leaders Chippenham Town to three points.